So I've been wanting to try out one of these ladder type stepped attenuators for a while now. These devices are a substitute for traditional continuous potentiometers. Instead of moving a wiper across a restive element, these devices actually switch in different resistors at each of a large number of shaft settings to simulate the resistance one would get from a potentiometer of a given taper function. The main benefit of this arrangement is that the devices may be built from low noise metal film resistors making them significantly quieter than traditional hot formed carbon or even conductive plastic potentiometers. So I thought I'd finally give one a try. My first decision was to decide how I wanted to wire up the control. 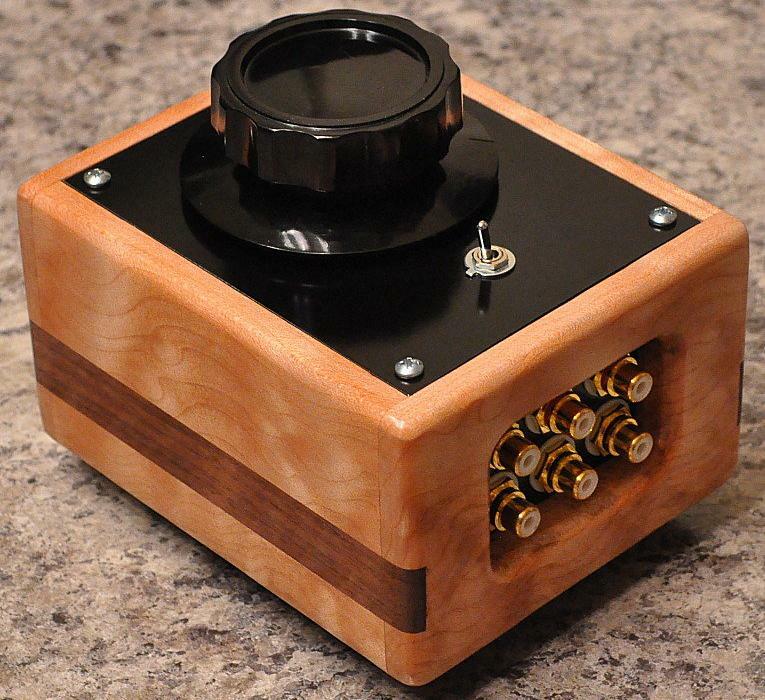 I was reluctant to include it in an amplifier or preamp project without knowing how I would like the result. 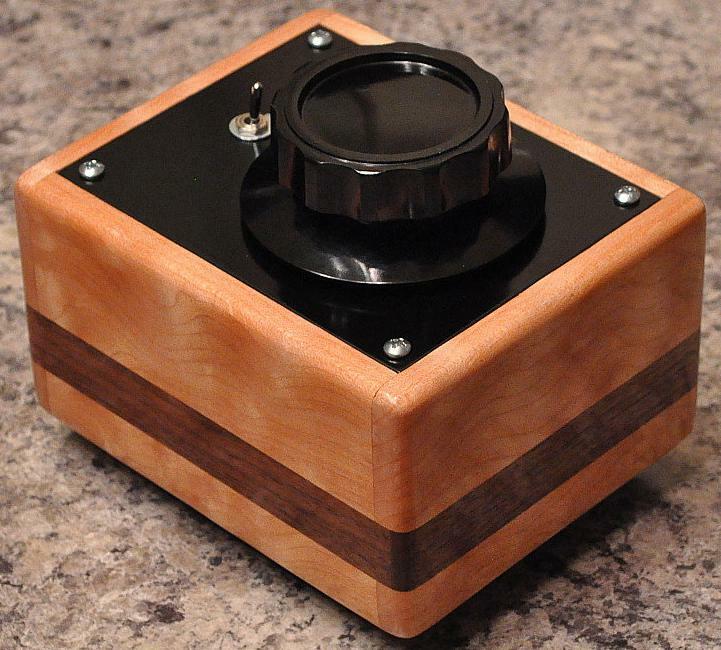 So I decided to build it into a standalone passive volume control. I also decided that I wanted to be able to switch between a couple of different sources. In order to prevent this new control device from inducing any unwanted ground loops in my setup, I decided that I would keep grounds isolated and switch both hot and ground leads. This lead to the following schematic. Notice that the 4 Pole Double Throw (4PDT) switch takes care of both the grounds and the hot leads so that when one source is selected, the control is neatly inserted into the circuit without any ground sharing. The grounds from the unselected source are completely isolated from the circuit and the left and right channels share no ground connection. 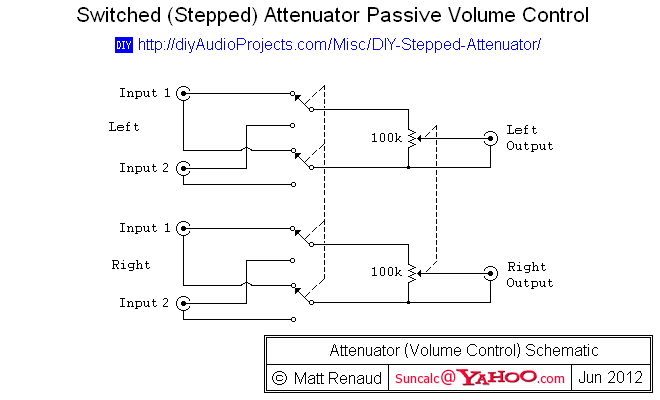 With the schematic settled I needed to chose an attenuator. This is actually a more difficult task than one might assume. My goal was to find a replacement for volume potentiometers without breaking my budget for an entire amp. I found some of these devices for as much as $360US for a stereo unit. Not wanting to spend nearly that much, I decided to settle on one of the Taiwan importers. Many of these manufacturers produce good quality components at reasonable prices. So I purchased a stereo 100kΩ 24-position stepped attenuator fully assembled for $18US from an online retailer called 8 Audio-Mall. 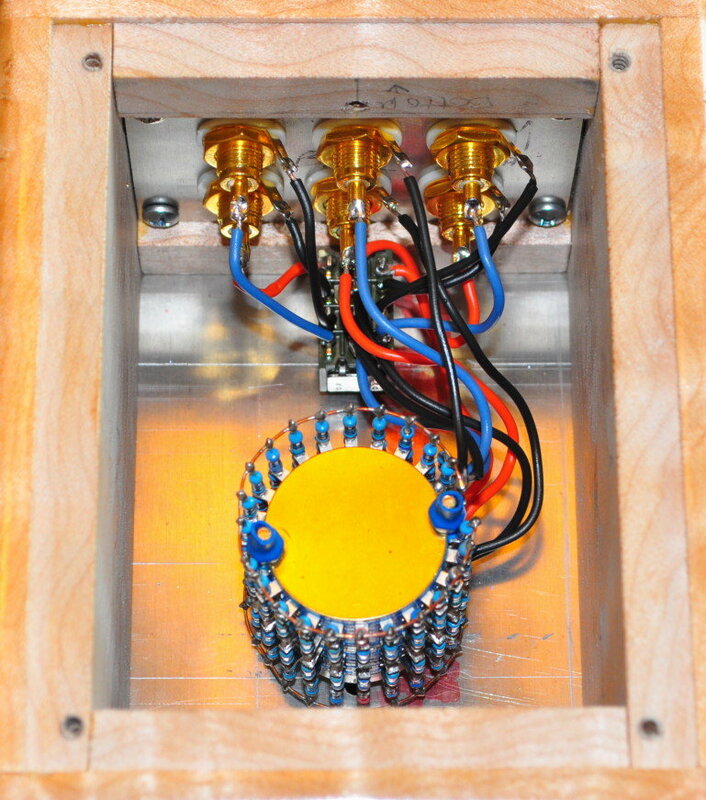 Here is a picture of the stepped attenuator unit. The unit uses 1% precision metal film resistors on a "make before break" multi-position switch. Initial testing on the unit showed channel mismatch of less than 0.25dB and a true logarithmic progression on the 24 different settings. A quick noise figure check showed that the bare unit has a noise figure ~26dB lower than a PEC hot molded carbon potentiometer of the same value. On the down side, the feel is definitely that of a switch and not a potentiometer. Although the step transitions were smooth and regular, a fair amount of torque was required to change settings. Becoming accustomed to this feel will surely take some time. However, all in all, this is unit seems to be a fairly good deal for the price. Wiring the attenuator unit per the manufactures instructions was not an issue. I decided to use a large skirted equipment knob to help overcome the stiff action of the switch. The larger the diameter of the knob, the greater applied torque and the easier the control will operate. The knob I used is ~2-1/4 inches in diameter. I installed the unit in a small wooden enclosure with painted aluminum top and bottom plates. Here is the result. 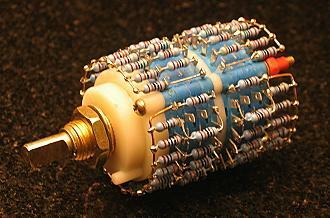 Connections are made on the back via six isolated RCA connectors. The sources are fed from the left and right set of RCA jacks (top and bottom for left and right channels) and the output is through the center set. Source selection is via the small switch by the volume control knob. The insides of the unit are almost as tidy as the outside. Here is a shot of the interior of the unit prior to base installation. Wiring is a little tight. Given a chance to do it again, I would probably make the box just a little bigger front to back to leave more room between the selector switch and the output RCA jacks. Using the rule that the load should be at least four times the output impedance, this means that the amplifier to which the control is connected should have an input impedance of over 100kΩ. How much over is dependent on the output impedance of the source. The other limiting condition is that the control should not unduly load any source to which it is connected. This time, at the zero volume position, the input impedance will be the 100kΩ total resistance. And at full volume, the input impedance will be the 100kΩ resistance shunted by the input impedance of the following amplifier. In this case, this is the limiting factor. So here if we assume an amplifier input impedance of 100kΩ then our worst case control input impedance will be 50kΩ. Using the rule that the load should be at least four times the output impedance, this means that our sources should have a maximum output impedance of approximately 12.5kΩ. Usually these limitations are not an issue. If the sources are solid state virtually all devices will have an output impedance significantly lower than 12.5kΩ. Even with tube stages, for a bypassed common cathode stage the output impedance is the parallel combination of the plate resistance and the load resistance. For very high-mu triodes (like the 12AX7 or the 6SL7) this might be a problem, but most line driver stages will have significantly lower output impedance than this limit. One final note on the limitations listed above. These limitations only apply if there is a strong need to preserve the taper characteristic of the control. If some distortion of the volume setting curve is permissible (e.g. 50% shaft position does not need to equate to exactly -20dBv) then the limitations can be significantly relaxed. The only caution is to be sure to calculate the low and high end frequency responses of the total chain to ensure that fidelity is preserved. I am very pleased with the results of the final build. I tested the control with the inputs driven by a computer sound card and an iPod connected through the dock connector. The output was connected to a very quiet vacuum tube amplifier with an input impedance of 100kΩ. With both inputs playing there was no popping or noise when switching from one input to the other. Volume transitions were smooth with no noticeable jumping between steps. Even with the large diameter control knob, the feel of the control is still fairly switch like. However, as a master volume control on a larger amp I think the feel of the control would be entirely acceptable. This control is significantly quieter than any carbon or conductive plastic potentiometer I have ever used. Given the level of success here, I now consider these stepped attenuators to be a very reasonable option for inclusion into my amplifier projects.